Nissy - Made huge difference to my skin! I've always been blighted by uneven skin tone (which looks worse after a bit of a tan in summer) and skin pigmentation. I've used this for 3 months now and it's made such a huge difference to the brightness and clarity of my skin, my ever eagle-eyed mum thinks my skin has never been better! Uneven skin tone has evened out slightly so hoping that using it a bit longer will help sort it out a bit more. Took awhile to work out a routine that worked for me but ended up using it in the morning after my serum, it's a little bit sticky so needs some time to sink in. Dave - Game Changer love it!! Love, love this product! I use it every morning, two or three drops in my serum before following with moisturiser and then SPF. After two weeks my skin is more even toned, scars appear faded and even sun spots have faded. Love it!! There's not much to say, this thing works. It brightens my skin, helps to fade red marks from my occasional spots. I'm not sure if it smooths my skin but it certainly helped decelerate the production of any new fine lines as I haven't seen any for a while. It doesn't, however, reduce brown spots that's not caused by breakouts (or maybe it does but very very slowly) so don't expect liver spots or general uneveness to disappear like miracle with this treatment. I also find it to work very well to start with, then it eventually just doesn't work as well anymore - maybe it's to do with the oxidation of the product. Ana - I love it! I really like this product , is very good at helping fade red marks from post breakouts and overall brightens the skin. I’m very pleased now you can get it in the UK because before it was a struggle to get it from the US . Highly recommend this product if you are looking for something to brighten your skin and help fading brown/red marks. So thrilled that this product is now available in the UK. I have recently moved here from Australia and have included this booster in my morning routine for years now. Absolutely love it! It does what it says. I am 54 and my skin looks and feels great. It brightens and evens skin tone keeping brown spots at bay despite spending all my teens and twenties ‘sun baking’ and with minimal if any protection in the Australian sun. Another brilliant product from Paula! Lynn - Clears uneven skin tone and brightens! I love this product and have been using it since before moving to the UK. Now that it's here I'm excited to finally get my hands on it again! It's great for scars and marks, evening out skin tones, and generally brightening skin. Don't use too much that it gets sticky, a little goes a long way for this product! I have been using PC products for a number of years & gradually, after some experimentation, I have built a fragrance and animal testing-free routine perfect for my sensitive aging skin. This booster was the missing piece. My brown spots have finally started to fade and my complexion is brighter after only 3 weeks of morning only use. This and the retinol booster in the evening have made the biggest difference. Mya - Amazing and finally in the UK! As I am in my late 20's I didn't know how much difference this would make to my skin but I have been pleasantly surprised! I love the pipette formula which allows you to add as little or as much as you'd like to your existing skincare routine. On first application my skin was luminous and bright- looking more radiant and uniform in appearance where my pigment normally is inconsistent. I look forward to seeing the difference in my skin over time. I love this booster! I've been using it three times a week since I ordered it and my skin looks brighter and more even - my sun spots have definitely faded. I'm officially addicted. I have never used anything that felt this good on my skin. I have only been using it for a short while now but my skin has never looked brighter and more even! I have very sensitive skin but this didn't irritate at all. Really easy to use and apply, and left my skin feeling beautifully soft and radiant. Thank you Paula!! Cathy - This looking good already! I have only been using this product for a week but I can already see that my skin tone is more even, and it is not irritating when used in the morning. When I tried to use it on top of the AHA 8 gel it was a bit too much so I now use it straight on cleansed and toned skin and then it works great! 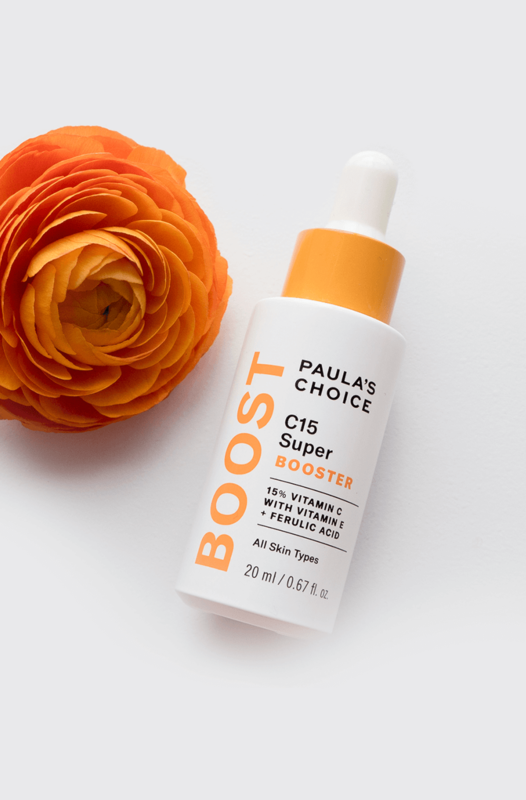 Customer Care Paula's Choice: Hi TJ, great to hear you love our C15 Super Booser as much as we do! Maria - Love this serum! I have been using this product for some time but until now I had to buy it when I was on holiday in the US so I am very happy it is finally here! I have tried a couple of vitamin C serums and this one is my absolute favorite. I love how easy it is to apply this product and I like the texture and smell. I started to see some results after a few weeks and I would not want to be without this product ever again! I received so many comments on how fab my skin is looking after using this product. 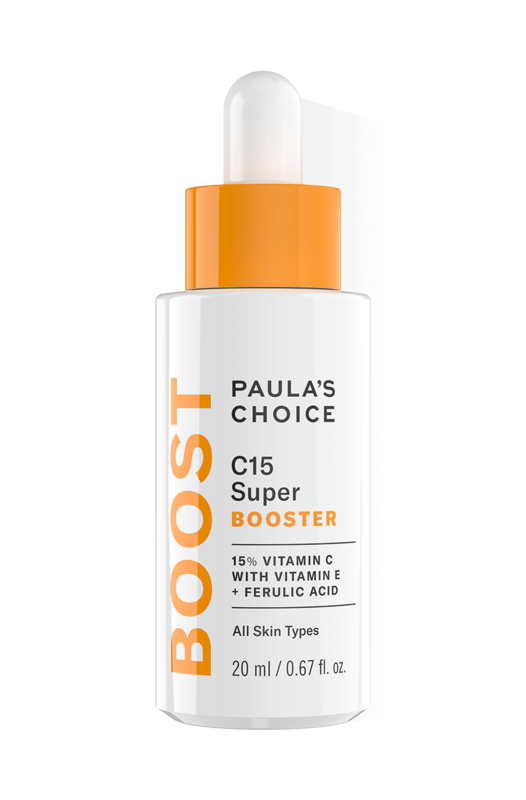 Customer Care Paula's Choice: Hi Maria, thank you for sharing your experience with us, great to hear you love our C15 Super Booster so much!